There have been a number of science fiction and fantasy writers with ties to Caltech, but from the 1960s on, three have stood out, in terms of quantity, quality, and impact on the field. Larry Niven was the first of these. He entered Caltech, only to leave partway through his undergraduate years. His love of mathematics was second to his growing interest in science fiction, and after getting a degree from another school, while in grad school at UCLA he began to write the stuff. Soon, editors started buying his stories, and the world lost a mathematician and gained an award-winning science fiction writer. Like a lot of other SF authors, he discovered that science could catch up with his stories. His first published professional story had barely come out when astronomers discovered things that made part of it not work. 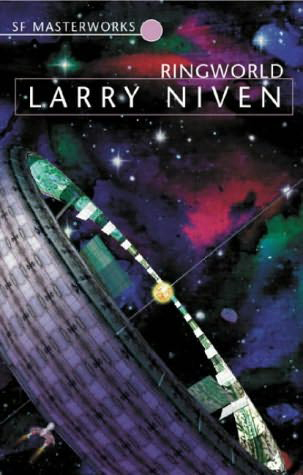 Ringworld is probably still his most famous novel, winner of multiple awards, but overall Larry Niven has spent more than fifty years entertaining audiences with tales of gigantic artificial planets, unusual alien invasions, and a time machine that isn’t quite what it seems, along with a host of other ideas. He remains involved with writing, with fans and with helping to guide other writers. Harry Turtledove is another prolific SF author who decided that Caltech and science were not for him. After leaving Caltech, he became trained in Byzantine history, of all things, and has written novels based on that study. He also helped to create the modern Alternate History form of fiction, with many novels spawned by the simple question “what if”? His first novels came out under a pseudonym, because his editor said “Who would believe your name is Turtledove”? Over the years, though, his own name has been on dozens of novels, and his several pseudonyms have each written multiple books as well. 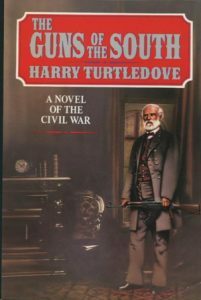 His time travel story, Guns of the South, helped start discussions and arguments at science fiction clubs and historical societies all over the English-speaking world, while his other novels look at natural disasters, alternate histories and elaborate fantasy worlds. He remains a popular speaker at events and science fiction conventions. David Brin actually decided to stay with Caltech and with the sciences, while writing award-winning SF novels. After graduating from Caltech, he got his Masters and PhD degrees from UC San Diego, in applied physics and space science, respectively. His early SF writing success was with a series in which he postulated a universe with lots of intelligent life, but which also had rules for the relative standing of a species. Basically, you had to help other species achieve intelligence in order to look good. 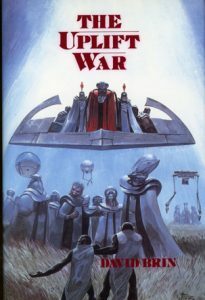 This “Uplift” series of six books began with Sundiver in 1980. One of his other novels was turned into a major motion picture. Unfortunately, it was not well-made, and thus The Postman was widely seen, but not as good as the novel. David Brin remains committed to both science and science fiction, and is on the volunteer board which is attempting to build a science fiction museum in Washington, D.C.
Read Caltech Writers: Part I, which was published on March 28, 2018.